In an ideal world, you’ve helped your customer build Role Centers specific to each of the organization’s roles. But, when you need to help someone with their role, sometimes getting to it from your own role can be tricky. 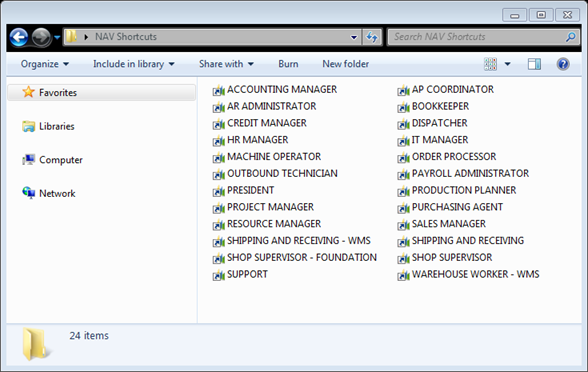 If your organization also makes use of the Profile Customization level, you might have twice that number of shortcuts. Obviously, making all of these can be fairly time consuming. Make sure the Locations are set up top (they default to common locations in Windows 7 64 bit environments, you may need to adjust them), select which Profiles (Roles) you’d like shortcuts for, and click Generate. You can also set the shortcuts to be created in Configure mode if needed. The resulting shortcuts tend to be fairly portable, as long as they’re moving between similar environments. 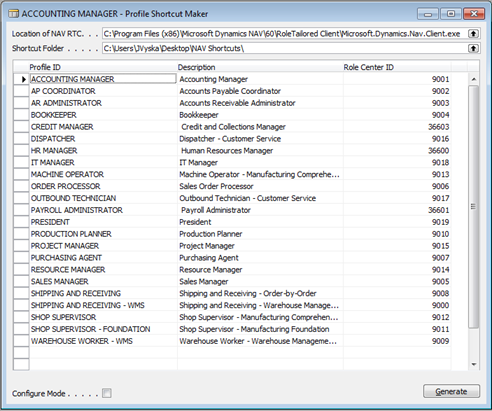 This tool also handles custom profiles as easily as built-in ones. This allows you to give IT staff, department heads, or anyone the ability to access the specific roles that are needed via easy to use (and easy to create) shortcuts. Featured Posts, NAV Configuration, NAV Usage Dynamics NAV. permalink.